Step 1: Cut off the top of 4 apples off and discard. Remove the inside of each apple with a spoon or melon baller very carefully, as to not puncture the peel. Step 2: Remove skin from remaining apple(s) and slice very thinly. 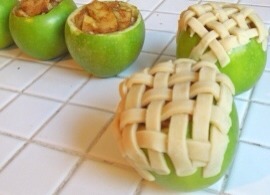 These apple pieces will give you the additional filling needed to fill the four apples you are baking. Step 3: Roll out pie crust and slice into 1/4 inch strips. You can also add a strip of pastry inside the top of the apple almost like a liner to add a little more texture/sweetness to the pie. Step 4: Place apples in an 8Ãƒâ€”8 pan. Add just enough water to the cover the bottom of the pan.